Doesn't that kind of bother you, that you need something bad to happen to profit from it? Almost the anti-District 9, this is more a travelogue tale whereby an initially mismatched pair bond through extreme ordeals. 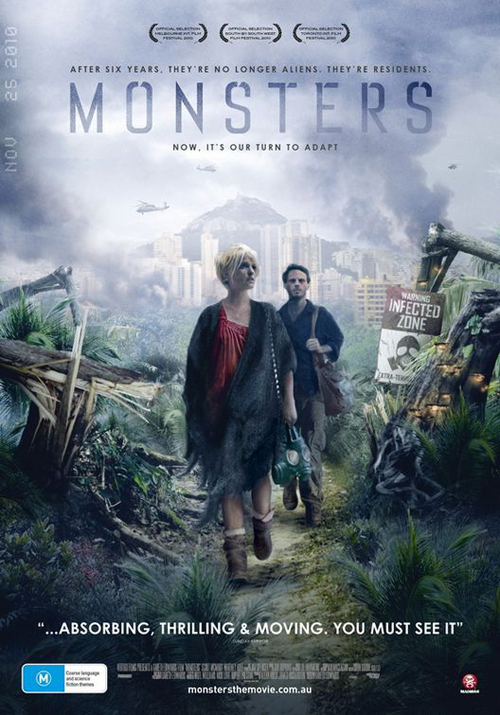 It's the performances and feel for the environment that makes Monsters gel. The (peripheral) creature effects are there to give the backdrop to events, not the focus. And the two leads (an actual couple) are naturalistic and served dialogue that feels of-a-piece. A strong debut from Gareth Edwards, the polished results he's delivered on a low budget have understandably yielded a thousand press articles. It's a bit of a shame he's moving on to Godzilla next, as you come away with a sense that it's the ambiance and intimacy of the piece where he's really excelled.